Multivitamin/Multimineral Supplement. New formula! More vitamin D (As compared to previous formula). Energy. Immunity. Metabolism. Muscle function. Energy: B-vitamins and iron support daily energy needs. Immunity: Antioxidants (Refers to vitamins C, E, beta-carotene and zinc) support normal immune function. Metabolism: B-vitamins aid in the metabolism of fats, carbohydrates and proteins. Muscle Function: Magnesium, vitamins D and B6 support muscle function. For the most important parts of you. Complete from A to zinc (Refers to all nutrients with an RDI). Questions? Comments? Call 1-877-Centrum (236-8786). 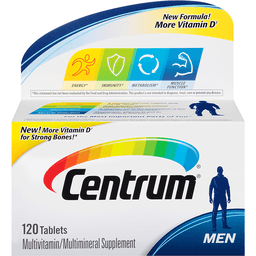 For more recent product information, visit www.centrum.com. 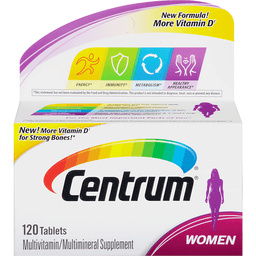 For complete information visit Centrum.com. (This statement has not been evaluated by the Food and Drug Administration. This product is not intended to diagnose, treat, cure, or prevent any disease.) Made in Canada.